As good as it gets: a rare moment of peace for Beefy on the 1985/86 West Indies tour. On the final afternoon of play at The Oval in the 1991 series between England and West Indies, the heavily padded, white-helmeted veteran took strike to face his only delivery of the home side’s second innings. The occasional medium pace of Clayton Lambert was wheeled out by the visiting captain – the soon to be retired Vivian Richards – in a sign that the game was up and England had won the game and drawn the series. Comprising teams more evenly matched than at any point in the previous decade, the series ended 2-2. Lambert eased up to the crease and the resulting long-hop was despatched to cow corner by the 35 year old all-rounder. His face etched with wonder and elation, he raced off the field with a look on his face that made the followers of his career think of those exploits a decade earlier. In this particular Oval Test he had performed creditably and had received special thanks from the chairman of selectors, Ted Dexter. His first innings 31 had only come to an end when he had failed to get “his leg over”, in the famous words of Brian Johnson in the TMS studio and was unavoidably dismissed hit wicket from the bowling of Curtley Ambrose. In each innings he had been naggingly accurate with the ball, a pale facsimile of the rampaging fast-medium swing bowler of yore, but with intelligent use of the crease, seam and cut he had bowled few bad balls in each innings and had finished the match with figures of 27-8-67-3. Moreover, he had gone for a paltry 2.48 per over against a batting line-up which still featured Richards, Haynes, Dujon and Richardson, in addition to the axe wielding of Simmonds and the old-world classicism of Carl Hooper. An alien watching this match might have thought it had always been thus. Ian Botham, so heavily dressed for battle in the dying moments of that August afternoon that he referred to himself as a “brontosaurus”, with small head peering out of a “Michelin Man” body, was reaching the end of a glittering career against all opposition. All opponents that is, bar one. The glaring omission on the CV of English cricket’s most celebrated post-war performer is that of tangible success against West Indies: namely the absence of a Test match century in the 20 games played against them during the period 1980-1991. On the surface his career batting average of 21.40 against the Caribbean giants and bowling average of 35.18 are hardly commensurate with a man regarded as a true great of the game. Likewise, his average in the West Indies itself during tours in 1980/81 and 1985/86 is even worse: a batting average of 14.17 and a bowling mean of 39.50 are hardly statistics to induce sleeplessness among those who guard the reputation of Sir Garfield Sobers as the greatest all-rounder ever to take the field. Was Botham’s comparative “failure” against West Indies the result of a player finding top class oppostion simply too hot to handle; a flat-track bully who had gorged on Packer-era second teams and who had then being found out against the real thing? Alternatively, there is a strong case for arguing that Ian Botham was simply unfortunate in his timing and that his supposed Achilles heel against the teams of Lloyd and Richards requires greater scrutiny. There can be little doubt, looking back, that the decision to award Ian Terrence Botham the England captaincy in the spring of 1980 was a major turning point in his career. His short, turbulent reign and subsequent comeback from it created his own legend which still endures today. He and England had just completed a tiring tour of Australia the previous winter, having lost all three Test matches to Greg Chappell’s full cream Australian XI. On their way back, England hopped off the plane in Mumbai to contest the Jubilee Test with India. Botham’s thirteen wicket haul and 114 with the bat ensured a comfortable England victory. It also meant that, at the age of 24, his Test record was reaching gargantuan proportions and with it the all-rounder was developing the profile of a latter day WG Grace. As the 1980 domestic season dawned Botham had played 25 Tests and had made 1336 runs at 40.48 and, incredibly, had also taken 139 wickets at 18.52. When Brearley resigned as captain there was no obvious understudy of similar age or background, no obvious county captain to turn to to hold the fort while a longer-term successor was groomed. Boycott would have been too divisive, Willis untried and untested, his fitness at that stage still a major concern. Gower, too, then short of his 23rd bithday cannot have been given serious consideration. Similarly, Gooch was still finding his way as an opening batsman and would not merit serious consideration as a leader until nearer the decade’s end. Gatting, Gower’s exact contemporary, was still three years away from taking over at Lord’s with Middlesex. So it was then that the “crown of thorns” in Brearley’s own words, passed onto the head of Somerset’s leading light. Whereas England turned to Keith Fletcher in the winter of 1981-82 to lead England in India, this time Lord’s opted to promote from within. Whoever took over at that point the task was one of the most daunting in living memory. Back to back series, home and away, against the West Indians of Clive Lloyd. Though in retrospect it seems a short-sighted and disastrous appointment, Botham’s promotion to the top job in English cricket was just about the best decision the selectors could have made at that time. The best choice, that is, if they were convinced of promoting from within the team itself. County captains such as Brian Rose at Somerset would perhaps have been unsure of their place on batting merit alone, although Rose did perform creditably when called up that summer. Fletcher, too, may have been thought a retrograde appointment, given that he was 36 at that point and had not played Test cricket since March 1977. Brearley’s blessing may have weighed on the selectors’ minds, too, and the silver haired polymath was not alone in recognising Botham’s cricket intelligence. Boycott has also spoken of Botham’s tactical nous on numerous occasions and has listed several examples of it from the 1980 home series and subsequent winter tour. And so a selection panel of Alec Bedser, Peter May, Charlie Elliot and Kenny Barrington plumped for the bearded young prince of English cricket. If we discount that one Test in August 1991 where our hero smashed the winning runs at The Oval, each of Botham’s remaining 19 Tests against West Indies came during the period 1980-1985/6. Moreover, his initial nine forays against them at the highest level came in back-to-back series while he was captain. Therefore, his appointment as England captain ahead of the visit of the West Indies in 1980 is absolutely key in judging his whole career against the men from the Caribbean. Nineteen Test matches, that is, before Richards began what Hilary Beckles describes as “the final restructuring” of the Lloyd era and the retirements of Garner, Holding and Gomes took place. Moreover, virtually half of his career total of Tests against them, nine, would come in under one year. From that starting point, then, we can reach a fairer assessment of his supposed “failure” against them. Having narrowly lost the first Test at Trent Bridge in June 1980 England clung on through grim weather to be somewhat flattered by a 1-0 final series reverse. The new skipper had begun with a thumping 57 in the first match but thereafter lost his way with the bat. Subsequent scores of 4, 8, 8, 35, 9, 4, 37 and 7 gave him a series total of 169 at an average of 18.77. Similarly with the ball, he seemed to palpably lose confidence after Nottingham and looked to view his own role as being that of a stock bowler on occasions. A series return of 13 wickets at 29.61 looks respectable enough but the truth is in the details. Whether inhibited by the captaincy or not, he seemed reluctant at times to grab the ball himself and really charge in as an attacking spearhead. Furthermore, only once in the series did he take the new ball himself. Thereafter, a familiar sight throughout 1980 and the early part of 1981 until his rebirth at Leeds against the Australians was the leaden-footed trot to the crease. The bull-charge, so redolent of his burst on to the scene in the latter 1970s can only be said to have reappeared at Edgbaston in August 1981. The disaster of the 1980-81 West Indian tour took its toll on Botham’s form even more so. Without doubt distracted by the political machinations of events in Guyana, the Robin Jackman affair and the death of the beloved Kenny Barrington, Botham sank into the depths of despair as events on the field mirrored life off it. The captain did not find solace out on the field as he had done before. Just 25, he was sensitive to criticism and evidently maladroit at handling some of his senior players. His taking to task of Gooch in front of the whole team as he questioned his habit of running prior to an innings made even Boycott wince. Why, Botham asked, had Gooch complained of tiredness after being out in the middle so long? He further claimed he was loath to accept batting criticism from a man with just one Test century, as Gooch had to his name at that time. The 2-0 series defeat in a truncated rubber after the cancellation of the Guyana Test was met with something approaching relief as England departed the islands and headed home to prepare for a series with Kim Hughes’ men. If the skipper’s efforts in the 1980 summer had been a cause for concern, so his performance as a player the following winter were enough for him to be placed on a match to match trial as England captain on his return home in the spring of 1981. In one of the cruelest examples of man-management the England selectors can ever have been privy to, the Somerset all-rounder was asked to perform a kind of early ’80s Strictly Come Dancing dance-off, as he would compete for his job on a Test-by-Test basis, with good results allowing him to remain in the show. Furthermore, in the Caribbean he had been hampered by the lack of a regular vice-captain, Willis having broken down once more with injury and then with the tour management desperately looking for a way to avoid handing the job to Geoff Boycott, it was eventually given to Derbyshire’s Geoff Miller, himself uncertain of a Test place. How the young tyro must have wished for Brearley’s counsel in those circumstances. A run with the bat of 0, 16, 26, 1, 13 and 16 gave him a series total of 73 at a mean of 10.42. The figures accurately reflected the mauling and frustration. With the ball he claimed 15 scalps at 32.80, though, again, rarely hitting the deck hard or bouncing in with real verve. His frame of mind seemed to be summed up at Barbados as he hurled his bat to the ground when a Michael Holding thunderbolt almost sliced him in two. An understandable gesture, perhaps, but hardly one which found favour with most of the players. “We hadn’t half his talent” said Peter Willey, sitting back in the dressing room, watching his captain “so what were we supposed to think?”. What an introduction to international captaincy it had been. A full year both home and overseas against the world’s premier team, complete with political intrigue, the spectre of South Africa and the Jackman affair, and the death of a member of the selection panel and much beloved father figure to many of the players. What happened on his return home to England after been removed from the captaincy at Lord’s in July 1981 does not require retelling here, except to say that generations of England all-rounders would seek to emulate it until Andrew Flintoff came up with his best impression of it in 2005. For Ian Botham and the West Indies, though, they would next renew their acquaintance in the English summer of 1984. The “Blackwash” summer of 1984 is probably best remembered from an English perspective for the hundreds in three consecutive Test matches made by Allan Lamb. Losing a series 5-0 is hardly the best background against which to look for positives among a losing side. However, Botham’s performances with bat, and occasionally with ball, in that series are a truer reflection of the capabilities of the man. His 347 runs at 34.7 are second only to Lamb in the league table and his haul of 19 wickets at 35.10 is perhaps better than it looks on paper. In both London Tests he roared in with the old swagger, attacking a line-up which consisted of Greenidge, Haynes, Gomes, Richards, Lloyd and Dujon. At Lord’s, in the second Test, he took 8 West Indian scalps for 103 as the visitors were shot out for 245. Unafraid to attack, he swung and seamed the ball and was not shy in using the bouncer either. This was not the apologetic trundler of the 1980 home summer or ’81 winter tour. At the Oval, too, his first innings 5-72 involved the setting of the trap for Richards with the bouncer and a much quicker, nastier, kicking throat ball to account for Dujon. If he was ineffectual at Edgbaston in the first Test, then so was everyone else as West Indies compiled 606 in their only innings. At Old Trafford in the fourth Test Gordon Greenidge’s long, technically accomplished 223 blunted all-comers as England were ground into the dust. In the previous game at Headingley, Bob Willis’ last Test match, the Goose was pummelled in a spectacular display of hitting from Michael Holding. With five sixes and three fours, Holding’s 59 was a brutal assault on Willis, doubly poignant since the Warwickshire man had been running in from the fabled Kirkstall Lane End throughout. The best England bowling in that game came from Paul Allott, giving a fine impersonation of a niggardly Brian Statham as he strangled the Windies batsmen running up the hill. Botham, with just seven overs for 45 was spared the whirling blade of Holding. With the bat in that series Botham achieved what he had singularly failed to do in the preceding series against the West Indies: marry aggression with judicious shot selection. Although Wisden described his Edgbaston first innings half-century as being that of a “gambler”, for the most part this was the Botham that we had come to see against all other opposition. His sequence of scores read: 64, 38, 30, 81, 45, 14, 6, 1, 14, 54. Had Gordon Greenidge not been so inconsiderate in scoring 214* on the final day at Lord’s in the second Test, then Botham would justifiably have run away with the man of the match award. As it was the award was shared as Beefy’s 8-103 was augmented with scores of 30 and a second innings 81. That second innings knock is worthy of analysis. It was the archetypal Botham innings. Joining Lamb with the score 88-4, the two added 128 in a partnership full of fine strokes, with Lamb going on to the first of his three hundreds that series. Botham, however, was the senior partner, reaching his half-century off just 41 balls. It was a counter-attacking knock that, had he reached three figures, would rank among his finest. As it was his driving was firm and sure footed, with one particularly spanking off-drive off Garner leading him to lift both feet off the ground as the ball hit the fence like a bullet. In the forties he hooked Marshall into the Mound Stand for a huge six and was otherwise watchful in defence. Finally lbw to his Somerset team-mate, Garner, the look on his face showed the disappointment of one who he had come so close yet so far. Television replays detected the semblance of an edge onto his pads, too, which made the dismissal all the more disappointing. The white helmet notwithstanding, this was the Botham of the previous winter’s 138 against New Zealand in Auckland; of the 208 against India at The Oval in 1982 and proved even a reminder of the man who made 118 three years before at Old Trafford against the Australians. This was Guy the Gorilla at his best; not a chancer’s slog but a controlled, calculated display of aggression against the best team out there. The great all-rounder had shaped up well against the Windies in 1984 and would sit out David Gower’s touring party of India that winter for a rest, his first winter off for eight years. Returning in fine fettle in the summer of ’85 against the old enemy for another Ashes encounter, he was a whirlwind of startling cameos, big sixes, a golden mullet, rasta sweatbands and his quickest bowling in years, which brought him 31 wickets in the six Tests. Although he hit 60 in no time at Headingley in the opening Test and a more restrained 85 at Lord’s, the epitome of Botham that summer was his innings, lasting just five balls, at Edgbaston in the fifth game. Strolling out in what can hardly be described as a crisis at 595-4, the colossus hit the kind of straight six off McDermott from his first delivery which is difficult enough to execute when well set. His third delivery was despatched in the same fashion before he holed out to a tumbling Thommo catch at deep mid-wicket. It seemed now that his raison d’etre was to entertain. He had hit a record number of sixes that summer and had also won the Walter Lawrence Trophy for the fastest domestic hundred, too. Cricket watchers around the country were giddy as England reclaimed the Ashes with their returning stars, Gooch and Emburey, along with Golden Boy, Gower, so elegant that summer and, of course, Beefy himself. It seemed inconceivable that England would endure the kind of mauling in the Caribbean that they had suffered at home in 1984. Little did they know that England would not only suffer their worst overseas humiliation in decades but that Ian Botham would undergo the worst tour of his career. In simple terms the great years of Sir Ian Botham, the cricketer, reached their end the day England celebrated the Ashes triumph on The Oval balcony on 2nd September 1985. That November he reached 30 and England headed for the Caribbean for a turbulent, ritually humiliating series which ended in another Blackwash. If anything this one was more conclusive, with England seldom looking in a position to achieve parity. The all-rounder’s sequence of scores with the bat in Tests read: 15, 29, 2, 1, 14, 21, 38, 25, 10, 13. His final tally of 168 at 16.80 is a fair reflection of his impact. Occasionally, as if aware that a killer delivery was on its way, he would lash out and go for the big hit in an effort to get runs on the board. With the ball, save for one five wicket haul in Port-of-Spain in the fourth Test, he was largely ineffectual to the point of being totally benign. Outside of the fourth Test his 6 wickets in the remaining four games is a testimony to his effectiveness. 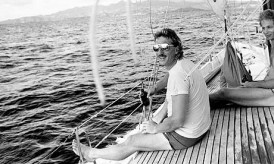 It must be pointed out, though, that Botham was hamstrung by the kind of circumstances that were a result of his own fame and notoriety, for he was to enjoy no peace or privacy on this tour. The trumped up allegations of former Miss Barbados, Lindy Field, and his decision to be out on a sailing boat as England were being thrashed by the inconsiderable might of the Windward Islands early in the tour meant that he had more than his share of distractions. His fame now meant that he was a travelling circus and, for reasons both good and bad, he could shift newspapers like no other British sportsperson of the era. From the summit of the 1985 Ashes summer he had crashed to earth once more. Although he would launch one last stellar performance in the winter of 1986-87 against Australia with a scorching 138 at the ‘Gabba, the great days were over, after which came his relegation to bit-part status until retirement from international duty came, courtesy of the yorkers of Waqar Younis, in 1992. Sir Ian Botham’s record against the West Indies has long been the subject of conjecture. True, he never did make that Test century. True, he rarely seemed to have the West Indian batsmen under the kind of spell which seemed to so hypnotise Kim Hughes’ and Allan Border’s Australians in particular. As a twenty-four year old on the crest of a wave, however, he was saddled with the kind of burden that few cricketers would have turned into a positive. With no prior experience of captaincy he had the misfortune of leading his team against opposition so strong, daunting and downright intimidating that they represented an almost parallel form of the game itself. David Frith was not wrong when he remarked, in the middle 1980s, that there were two forms of international cricket: one which involved playing the West Indies and the other, on a lower tier, which involved competition between all other Test playing nations. In his 9 Test matches against them during 1980 and 1980/81, Botham would have encountered as batsmen and captain a four man pace bowling attack which consisted of various permutations of Roberts, Holding, Garner, Croft and Marshall. In 1985-86, back in the Caribbean once more, he and the rest of David Gower’s team were confronted with perhaps the most fearsome bowling line-up ever to represent the West Indies: Marshall, Garner, Holding and Patterson. Even when Holding was injured in one Port-of-Spain Test he was replaced by his fellow Jamaican, Courteney Walsh. Moreover, during Botham’s comparatively successful 1984 summer series he was required to make his runs against Garner, Holding, Marshall and Baptiste. Holding’s injury in the second Test brought in Milton Small while Marshall’s absence at Old Trafford through injury allowed Winston Davis his chance. In short, it was relentless, and as Matthew Engel remarked after England’s defeat at Sabina Park in February 1986, the defeat came at the hands of the West Indies’ “threshing machine” which, at that time, looked like being able to refresh and renew itself into perpetuity. On close examination of all the speed formations that Botham would have faced in his 19 West Indian Tests in that period the “weakest” attack that he encountered probably came at Lord’s in 1984. Even then an attack consisting of Garner, Marshall, Small and Baptiste can hardly be considered as second rate. A pedant might make the observation that in 1984 the West Indies were operating with a pace triumvirate rather than an authentic quartet; that Baptiste was fast-medium rather than genuinely fast. This is true enough; although the outcome of the series was so definitive, the intensity still as unrelenting as ever. Having county team-mates in the West Indian team also represented an interesting dynamic for Ian Botham. In the case of Richards, godfather to Botham’s eldest son, Liam, the young England captain was also up against the world’s greatest batsman. With Garner roaring in to bowl at him while Richards lay in ambush in the slips, more than one of Botham’s England contemporaries has pointed out that the rivalry was treated in a much less light-hearted vain by the West Indies duo. Although the greatest of pals with their county colleague both Richards and Garner saw Botham as a threat and treated him as such out on the field of play. Clearly they set different limits; the after hours carousing and horseplay had its place but once out on the field it was business as usual for the Windies. With Botham, as his former England team-mates attest, that distinction was often blurred, as he was often felt to be “playing up” to his pals in the opposition. As a bowler Botham only truly found his zip during the 1984 home series, although his strike rate against the teams of Lloyd and Richards is revealing: his average of a wicket every 59.1 balls is comparable with an overall strike rate of 56.9. After that series and his ever increasing profile which came partly as a result of his management guru, Tim Hudson, the great all-rounder lost his way. Whereas he had been controlled and aggressive in 1984, with some success, during 1985-86 he displayed poor judgement, injudicious shot selection and a frightening profligacy with the ball. Truth to be told, he looked like a cricketer that had shot his bolt. He was a victim of fame and circumstance up against a formidable and relentless foe with an ever ready press-pack ready to pounce on his next fall from grace. In three series out of four, Sir Ian Botham was found wanting against West Indies. In his first two series as a 24 year old he was granted Mission Impossible. The man himself has always claimed that his first true loss of form as an international cricketer coincided with his tenure as captain. There may be a good deal of truth in this observation. The habit developed during the 1980 summer of falling over towards off-stump and being prone to lbw dismissals is indicative of a batsman out of touch. As if to prove the point, four times in nine Test innings that summer the West Indian quicks trapped the England captain leg before. It is more than likely that the loss of form came at a time when he had more than his own form to worry about and that the burden of leadership, together with the rarified nature of the opposition, meant that there was little scope for recovery. In 1986, in the Caribbean, he was a quite different animal. This time, wary of intrusions and burned by the effects of his own fame, he appeared to retreat into an increasingly hedonistic lifestyle to distract himself from the twin nightmares created by the opposition and the travelling scribes. In fairness, other than his skipper, Gower, and sporadically Gooch and Lamb, no batsman did himself justice in those circumstances. To recall the series of 1985/86 or to revisit the pages of Wisden Cricket Monthly from that spring is to bring the horrors of that tour back to life, for seldom other than in ’74-75 can life as an England supporter in the past 40 years have seemed so helpless. The home side were simply on a different plane and the visitors appeared to have no answer to the problems posed by them. When we consider that the batting line-up for that tour was a much trumpeted one: Gooch, Robinson, Gower, David Smith, Gatting, Lamb, Peter Willey and Botham; it is still difficult to fathom their abject failure in the face of Richards’ speed machine. For a more flattering and, I think, truer, picture of Ian Botham’s capabilities against the greatest team of his era we need to look back to 1984 when for one brief, shining moment he revived his better instincts, his bold yet controlled competitiveness and the spirit of earlier days to compete with Clive Lloyd’s team as an equal and not as a sad, careworn apologist. The West Indies’ reign was so absolute that in their greatest and most destructive period, 1979-1986, they left many casualties in their wake. The most high profile of these has been the reputation of Sir Ian Botham. He may not have been at his very best against them but England’s philanthropic knight of the realm has a record which deserves to be granted fresh perspective, given the circumstances of his ascent to the captaincy, his two plainly traumatic Caribbean tours and the inordinate dominance of the opposition. Since the article mentions Botham and Allan Lamb it is interesting to contrast the two batsman. Botham of course never reached triple figures against the WI pace-attack but Lamb hit 6 centuries. Consequently, I think that it was Botham’s technique with the bat that let him down. While Botham employed an exaggerated swing with a high backlift and follow through Lamb tended to be the opposite and punch the ball with perfect timing and minimal force. In other words he let the pace of the ball do the work. I think it is this ecomomy of effort, with its larger margin for error, that allowed Allan Lamb to succeed where Botham couldn’t. I think this is overall a fair assessment of Botham’s record against the West Indies. It is difficult to assess his performances in 1980/81 given the fact that he was captain, and against a much stronger team than his own. And it’s certainly right that the 1985 home series was the last in which he was a genuinely test class bowler (although, it must be said, against a very weak and demoralized Australian team). That said, there is a fair amount for the prosecution in this article. The fact that Botham was unwilling to take advice from Gooch reflects very poorly on him, especially since the one team Gooch had made a century against was the West Indies. And while Gooch’s obsessive fitness regime may not have been for all, Botham’s career was surely significantly circumscribed by his lack of training and poor fitness. Moreover, less charitable interpretations of his performance against the West Indies are possible. In the first place, of the great all rounders of his generation, his figures against the West Indies are by far the worst. Second, there is a good case for the argument that his batting technique against top class pace bowling was not quite good enough. And thirdly, he didn’t seem able or willing to moderate his game plan against the West Indies (at least until the 1991 game, when even he couldn’t deny that he was a shadow of the player he had once been). Looking over the 1984 and 1985/6 series, he seemed to get out an awful lot going for the hook shot; and he often went for a lot of runs very quickly bowling short to batsmen like Greenidge and Richards, in the hope of inducing a top edge off a pull or hook shot. Against someone like Hilditch that could work, but not against players as good as Greenidge and Richards. On balance, I’m inclined to think that Botham’s poor record against the West Indies should significantly effect how he is assessed as a player. At least, I would place him some way below Imran Khan and Richard Hadlee among his contemporaries, even though he was probably more naturally talented than either.